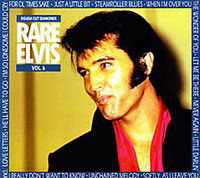 The bootleg release 'Rare Elvis Vol. 6' was announced for release. It contains 24 tracks and comes in a digi-pack. Santa very funny,Elvis fans love anything and everything Elvis. I like the series of Rare Elvis. must say i listen to those often. Good collection for people who didn't know about those songs /Versions. must say rare elvis vol.6 sounds interesting with Rough Mixes of Songs like I Really Don't Wanna Know. also the bonus undubbed unedited masters of I'm So Lonesome I Could Cry & Steamroller blues from aloha sound interesting. Hi Santa, not really my friend but maybe when you've done volume 536 I might have a flutter. I'm afraid I'm saving my pennies for Legendary Performer volume 397 and Elvis In Demand volume 276 at the moment. What a disappointment. I was hoping for Alternate Anthology Vol. 1495 and Legendary Performer Vol. 743. By the way: I started my own home-PC made series called "Santa Claus's Favourites" and I just finished Vol. 532. Anybody interested in those?